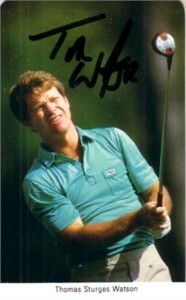 1987 Fax Pax golf card (slightly oversized with rounded corners) autographed by Hall of Famer Tom Watson, winner of 8 major tournaments. With certificate of authenticity from AutographsForSale.com. ONLY ONE AVAILABLE FOR SALE.